Loaded with 24g. lead n. 7 ¼ and marked “Bior” on the metal head. 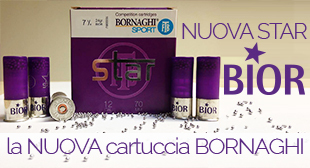 “To complete our STAR range we made a shotshell with a bior wad (with no container). The pattern of Star Bior opens a little bit before compared to a Discovery VM Wad (container wad), but it doesn’t mean that the patterns become too large, in fact we have god patterns even at 35 meters (38 yd)”.